In the evening of 4 May, the installation's injector (the ion source and low energy beam transport, LEBT) produced its first proton (hydrogen) beam. Developing materials resistant enough to withstand the high-power impact of the neutrons from deuterium-tritium (DT) reactions is of utmost importance for the future of fusion. This task has been assigned to the International Fusion Materials Irradiation Facility (IFMIF) which is presently in the Engineering Validation and Engineering Design Activities (EVEDA) phase. The project is part of the Broader Approach that Japan and the European Union formally launched in 2007. IFMIF is coordinated from Rokkasho, in northern Japan, and headed by Pascal Garin, formerly of CEA's Institute for Magnetic Fusion Research (IRFM) and Agence Iter France. 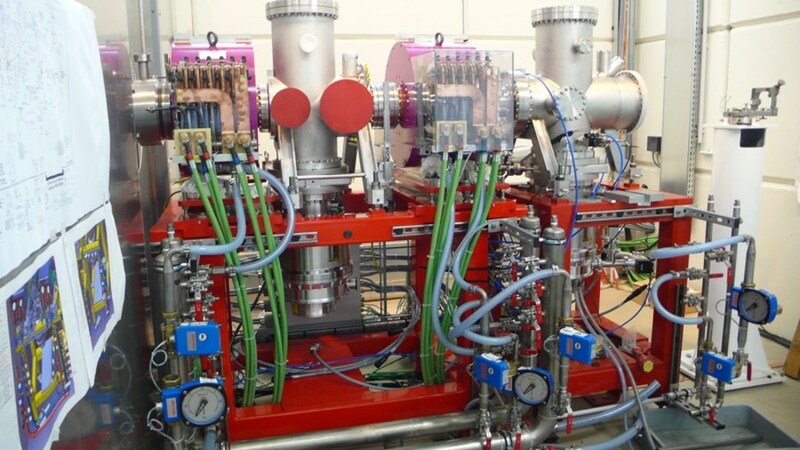 In the future IFMIF plant, whose location has not yet been decided, two coupled accelerators will each deliver a deuteron (deuterium ion) beam of 125 mA at 40 MeV in continuous wave to a lithium loop. The interaction of the accelerated deuterons with the liquid lithium in the loop will generate neutrons similar to those produced in the DT fusion reactions. These neutrons will in turn irradiate reduced-scale samples of material to be tested, and other experiments in specific modules. Construction of the EVEDA Lithium Test Loop (ELiTe) was completed in December 2010 at the JAEA Oarai Centre, Ibaraki prefecture. The installation was mildly affected by the 11 March 2011 earthquake—"Nothing really serious," says Garin—and its piping systems will require some checking before operations can resume. Ten thousand kilometres from Rokkasho, at CEA Saclay in the Paris region, work on the scale 1:1 prototype accelerator, now officially named LIPAc (Linear IFMIF Prototype Accelerator), reached an important milestone last week. The defining moment occurred in the evening of 4 May 2011, when the installation's injector produced its first proton (hydrogen) beam. CEA's Raphaël Gobin, in charge of the injector design, manufacture and experiments, announced that—after the successful generation of a first plasma in the ion source a few days before—the first beam was measured in the specific blockhouse built for this occasion. This first beam was in pulsed regime whereas the final one will be continuous. If LIPAc was a rocket, this would amount to the successful testing of the first stage ignite—a crucial step, but still a long way from commissioning the whole accelerator. The accelerator (see graph) is made of a succession of systems and devices that accelerate and focus the deuteron beam, and eventually "dump" and absorb its 1.1 MW energy. During the EVEDA phase, only the low energy section, which is the most challenging one, will be tested: the beam energy will reach 9 MeV at the end of the first cryomodule, while in IFMIF three extra cryomodules will bring the energy to 40 MeV that is required to optimize the production of neutrons. "LIPAc is the accelerator of all records," explains Pascal Garin. "In terms of intensity, we're above the present state-of-the-art by a factor 100 and the energy of the prototype will be among the highest in the world, even higher than SNS in Oak Ridge." Along with Japan, which is in charge of the infrastructure (buildings and power supply, cooling, central control command, etc.) several European institutes, coordinated by the European Domestic Agency Fusion for Energy, are contributing to LIPAc: the French CEA, the Spanish CIEMAT, the Italian INFN, the Belgian SCK•CEN. 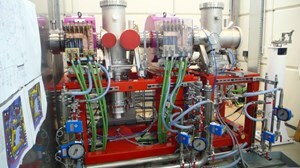 Once tested in Saclay, the injector will be shipped to Rokkasho within one year. The other systems will then be installed and the whole LIPAc assembled by mid-2015. Two years of experiments are planned in order to reach a stable and continuous beam at the full energy. This will be accomplished around the end of the Broader Approach, in mid-2017. In the actual IFMIF installation, the 40 MeV deuterium ions will generate an accumulated neutron flux (the "fluence") a hundred times that of ITER, and slightly above that of the future DEMO. The target samples will hence "age" some 20 to 40 percent faster than in an actual steady-state fusion reactor—a unique case of a particle accelerator that also accelerates time.